Via Ferrata dell' Amicizia. Discover Lake Garda! An extraordinary view, that astounds in front of every lens, and, in every photo album, is the one above the rooftops of Riva and the seemingly endless Lake Garda, on which the radiant sun glistens. 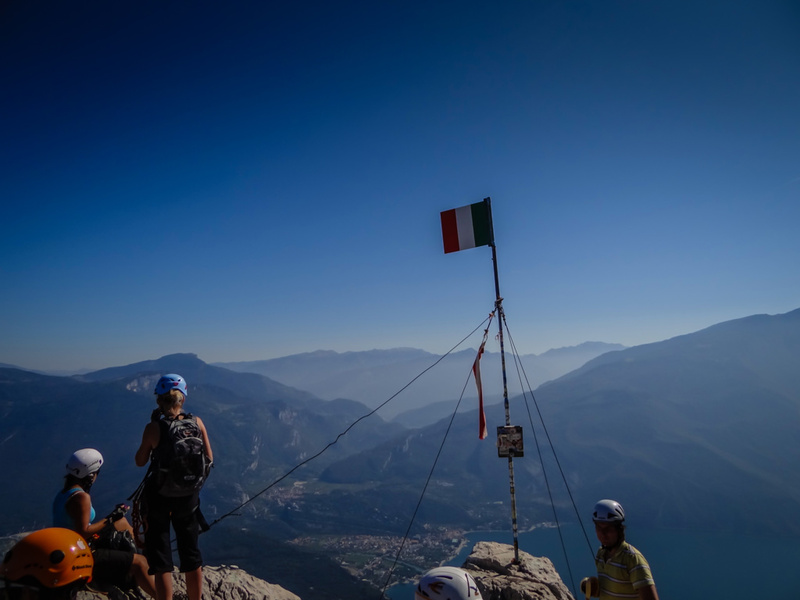 To be able to enjoy this unforgettable view at about 1264 vertical metres, you have to be one thing: Not afraid of heights. Perhaps this is the reason why it's aptly named the "Path To Friendship" because it's supposed to weld people together as they trek through thick and thin and climb dizzying heights over ladders and stones. 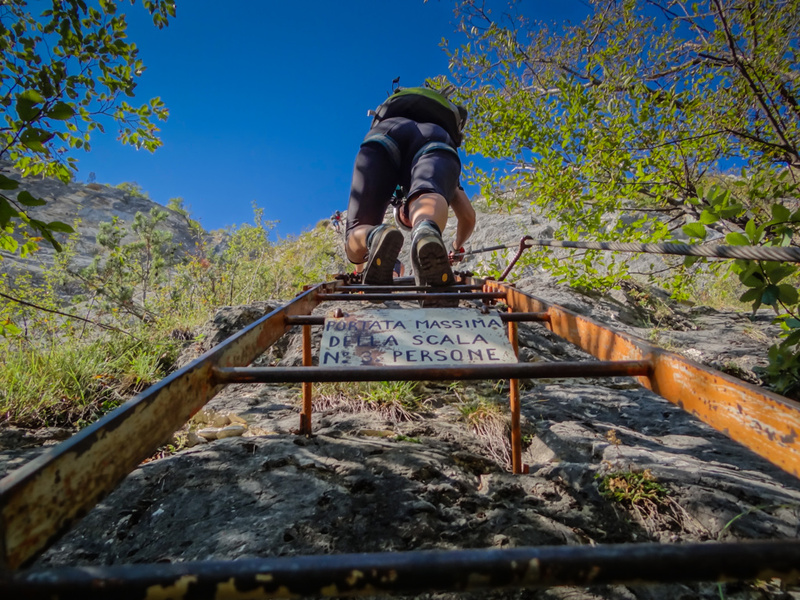 The path also has a different nickname; The ladder via ferrata. 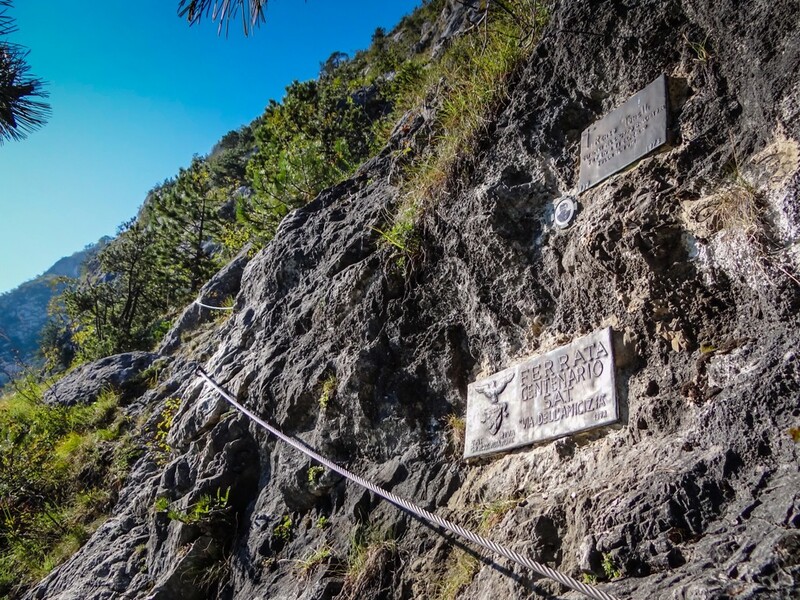 The via ferrata consists of extremely long ladders made of iron, which with their 130 rungs can seem to be endless. In the beginning, wire ropes help to climb the individual steep steps as well as a partially overhanging ladder. 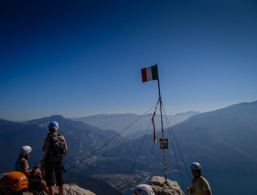 You’ll be happy with all of your effort when you finally reach the summit of Cima SAT because, in addition to the feeling of having made it, you have a breathtaking view over the village of Riva, Lake Garda and the whole area. It's simply indescribable. 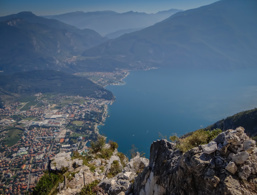 From Riva del Garda, drive to Limone sul Garda and keep to the west of the town, at the foot of the Rocchetta massif. 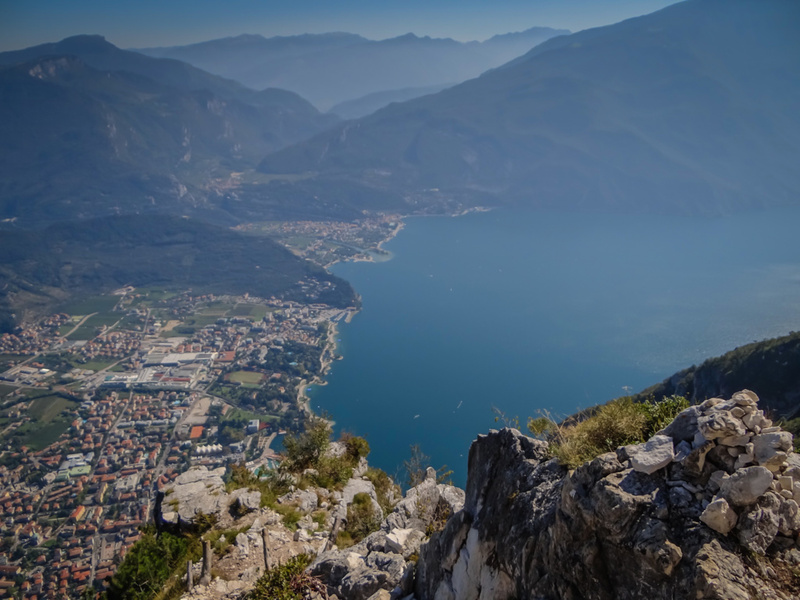 At the highest point, before the state road 45 leads downhill again, a small road begins leading to the bastion of Riva del Garda. On the right, next to the road or behind the hydroelectric power plant, you can park your car. Now follow the marked footpath SAT No. 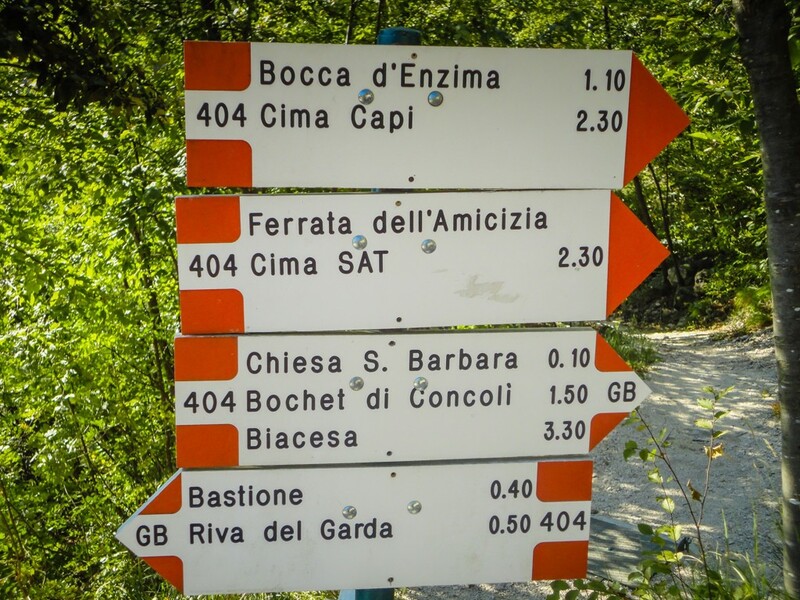 404 which leads you first up a few, hairpin bends over a cobbled street, where you reach the fortress "Bastione di Riva" after about 20-30 minutes. Further to the right, the path leads to the small chapel of St. Barbara and the St. Barbara mountain hut, which is only open on weekends in summer. After this cultural programme, continue to the right, and the adventure will begin. 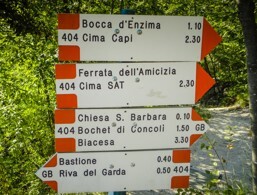 The sign, Ferrata Centenario SAT - Via dell'Amicizia, indicates the entry into the via ferrata. First, it goes over a wooded section, and then you get to the first vertical ladder, which is about 40 m high. It's divided into two parts by a metal platform on which you can take a breather. 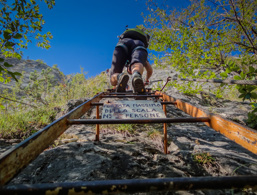 It follows a rocky section with a slightly shorter ladder before returning to a long, 70-meter-high ladder. The long ladder is somewhat overhanging, so strong arms will benefit you here. The spectacular panorama also motivates you to climb the last short ladders and steep edges before you reach the lookout cliff. Avoid the climb in the midday heat and summer. Spring and late summer are better suited. You need suitable climbing equipment, helmet, harness and gloves.